So this last month has been a hard reading month. You'll notice that I'm not including four books and that's not because I didn't read four (or more) books, it's just I can't talk about all of them (*cough* RITA *cough*). Hopefully next month I'll be right back to devouring my 2016 TBR pile, which will include diverse authors and genres to talk about! Yay! But actually, this month's reads were pretty diverse. In fact, they're so diverse, I'm finding it hard to find a theme that will hold all of them. I have a memoir by an Indian-American actress/writer/producer, a paranormal about the Grim Reaper and an Italian literary novel translated into English. I now know the theme for this entry. VOICE. All of these books have great VOICE. Carry on. Charley Davidson (the main character in this series, also known as the Grim Reaper) is one of those voices that can inspire me, make me laugh and make me feel immediacy. It took me a little longer to get into this book, probably because I waited so damn long between books, but the cliffhanger and the way Ms. Jones wrapped up on plot point and jumped into a new direction has me so excited to pick up #9, The Dirt on Ninth Grave ASAP. 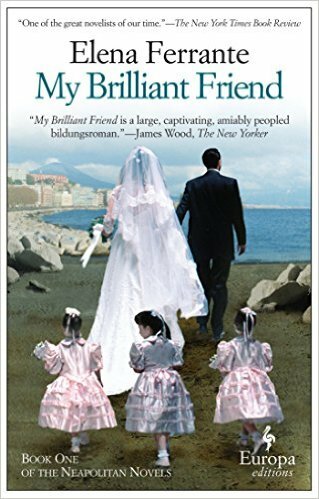 This month's selection was MY BRILLIANT FRIEND and I'm still trying to process it. The voice is incredibly intimate yet distant, with a beautiful musical quality. It's a story of a complicated friendship between two girls in post-War Naples and I flipped through the pages trying to figure out what was going to happen next, who was good, who was a psychopath, who was maybe a mentally ill murderer. I'd love to discuss this one with more of you! In case you aren't a digital reader, RUSHING TO DIE came out in paperback yesterday! If you've read it (or any of my books), please consider leaving a review wherever you bought it. I'm also giving away two copies on Goodreads and you have until February 14th to enter there! As always, I'd love to hear what you've been reading and what you thought about it! Leave a comment or hit me up on Facebook to discuss books, #mancrushmonday and more.